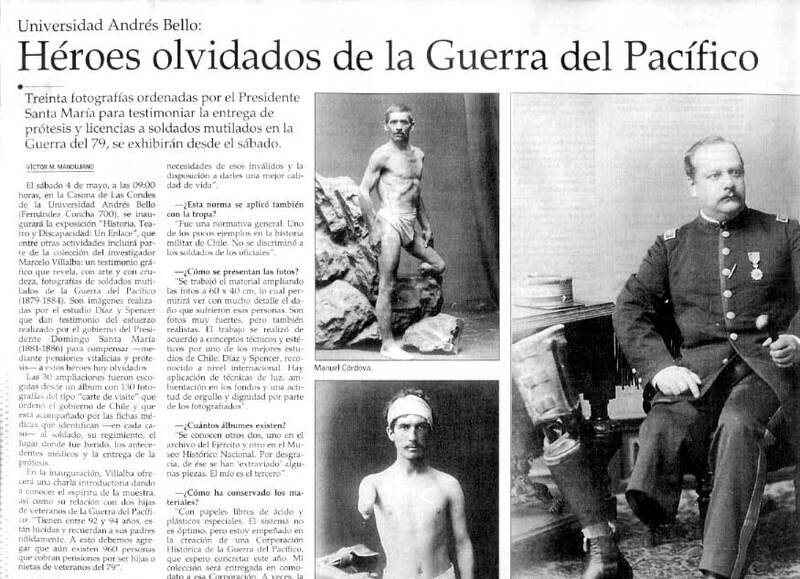 This article is about the 19th-century war between Bolivia, Chile and Peru. For the Pacific theater of World War II, see Pacific War. The War of the Pacific (Spanish: Guerra del Pacífico), also known as the Saltpeter War (Spanish: Guerra del Salitre) and by multiple other names was a war between Chile and a Bolivian-Peruvian alliance. It lasted from 1879 to 1884, and was fought over Chilean claims on coastal Bolivian territory in the Atacama Desert. The war ended with victory for Chile, which gained a significant amount of resource-rich territory from Peru and Bolivia. Chile's army took Bolivia's nitrate rich coastal region and Peru was defeated by Chile's navy. Map showing changes of territory due to the War of the Pacific. Former maps (1879) show different lines of the border between Bolivia-Peru and Bolivia-Argentina. Chilean victory/Bolivia becomes a landlocked country. Tacna Region occupied by Chile in 1885, returned to Peru in 1925. Arica Province and Tacna Province occupied by Chile in 1884, Tacna returned to Peru in 1929. Battles were fought in the Pacific Ocean, the Atacama Desert, Peru's deserts, and mountainous regions in the Andes. For the first five months the war played out in a naval campaign, as Chile struggled to establish a sea-based resupply corridor for its forces in the world's driest desert. In February 1878, Bolivia imposed a new tax on a Chilean mining company ("Compañía de Salitres y Ferrocarril de Antofagasta", CSFA) despite Bolivian express warranty in the 1874 Boundary Treaty that it would not increase taxes on Chilean persons or industries for 25 years. Chile protested and solicited to submit it to mediation, but Bolivia refused and considered it a subject of Bolivia's courts. Chile insisted and informed the Bolivian government that Chile would no longer consider itself bound by the 1874 Boundary Treaty if Bolivia did not suspend enforcing the law. On February 14, 1879 when Bolivian authorities attempted to auction the confiscated property of CSFA, Chilean armed forces occupied the port city of Antofagasta. 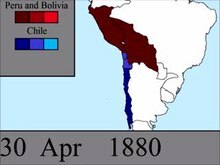 Peru, bound to Bolivia by their secret treaty of alliance from 1873, tried to mediate, but on 1 March 1879 Bolivia declared war on Chile and called on Peru to activate their alliance, while Chile demanded that Peru declare its neutrality. On April 5, after Peru refused this, Chile declared war on both nations. The following day, Peru responded by acknowledging the casus foederis. Even though the 1873 treaty and the imposition of the 10 centavos tax proved to be the casus belli, there were deeper, more fundamental reasons for the outbreak of hostilities in 1879. On the one hand, there was the power, prestige, and relative stability of Chile compared to the economic deterioration and political discontinuity which characterised both Peru and Bolivia after independence. On the other, there was the ongoing competition for economic and political hegemony in the region, complicated by a deep antipathy between Peru and Chile. In this milieu, the vagueness of the boundaries between the three states, coupled with the discovery of valuable guano and nitrate deposits in the disputed territories, combined to produce a diplomatic conundrum of insurmountable proportions. Afterwards, Chile's land campaign bested the Bolivian and Peruvian armies. Bolivia withdrew after the Battle of Tacna on May 26, 1880. Chilean forces occupied Lima in January 1881. Peruvian army remnants and irregulars waged a guerrilla war that did not change the war's outcome. Chile and Peru signed the Treaty of Ancón on October 20, 1883. Bolivia signed a truce with Chile in 1884. Chile acquired the Peruvian territory of Tarapacá, the disputed Bolivian department of Litoral (turning Bolivia into a landlocked country), as well as temporary control over the Peruvian provinces of Tacna and Arica. In 1904, Chile and Bolivia signed the "Treaty of Peace and Friendship" establishing definite boundaries. The 1929 Tacna–Arica compromise gave Arica to Chile and Tacna to Peru. 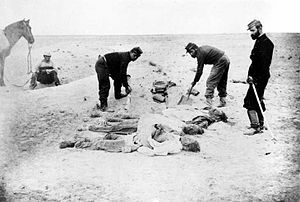 Chilean lieutenant Solo de Zaldívaricus and two soldiers burying three Bolivian soldiers after the Battle of Tacna. The elevation behind them is also a burial ground of victims. The conflict is also known as the "Saltpeter War", the "Ten Cents War" (in reference to the controversial ten-centavo tax imposed by the Bolivian government), and the "Second Pacific War". It should not to be confused with the pre-Columbian Saltpeter War, in what is now Mexico, nor the "Guano War" as the Chincha Islands War is sometimes named. Wanu (Hispanicized guano) is a Quechua word for fertilizer. Potassium nitrate (ordinary saltpeter) and sodium nitrate (Chile saltpeter) are nitrogen-containing compounds collectively referred to as salpeter, saltpetre, salitre, caliche, or nitrate. They are used as fertilizer, but have other important uses. Atacama is a Chilean region south of the Atacama Desert, which mostly coincides with the disputed Antofagasta province, known in Bolivia as Litoral. The Atacama border dispute between Bolivia and Chile concerning the sovereignty over the coastal territories between approximately the parallels 23°S and 24°S was just one of several long-running border conflicts in South America as the area gained independence throughout the nineteenth century, since uncertainty characterized the demarcation of frontiers according to the Uti possidetis 1810. The dry climate of the Peruvian and Bolivian coasts had permitted the accumulation and preservation of vast amounts of high-quality guano deposits and sodium nitrate. In the 1840s, Europeans knew the guano and nitrate's value as fertilizer and saltpeter's role in explosives. The Atacama Desert became economically important. Bolivia, Chile, and Peru were located in the area of the largest reserves of a resource the world demanded. During the Chincha Islands War (1864–1866), Spain, under Queen Isabella II, attempted to exploit an incident involving Spanish citizens in Peru to re-establish Spanish influence over the guano-rich Chincha Islands. Starting from the Chilean silver rush in the 1830s, the Atacama desert was prospected and populated by Chileans. Chilean and foreign enterprises in the region eventually extended their control to the Peruvian saltpeter works. In the Peruvian region of Tarapacá, Peruvian people constituted a minority behind both Chileans and Bolivians. Bolivia and Chile negotiated the "Boundary Treaty of 1866" ("Treaty of Mutual Benefits"). The treaty established the 24th parallel south, "from the littoral of the Pacific to the eastern limits of Chile", as their mutual boundary. The two countries also agreed to share the tax revenue from mineral exports from the territory between the 23rd and 25th parallel south. The bipartite tax collecting caused discontent, and the treaty lasted only 8 years. In February 1873, Peru and Bolivia signed a treaty of alliance against Chile. Its last clause kept it secret as long as both parties considered its publication unnecessary; it was revealed in 1879. Argentina, involved in a long-standing dispute with Chile over the Strait of Magellan and Patagonia, was secretly invited to join the pact, and in September 1873 the Argentine Chamber of Deputies approved the treaty and $6,000,000 for war preparations Eventually Argentina and Bolivia did not agree about the territories of Tarija and Chaco, and the former feared a Chile-Brazil axis. The Argentine Senate postponed and later rejected the approval, but in 1875 and 1877, after border disputes with Chile flared up anew, Argentina sought to join the treaty. At the onset of the war, in a renewed attempt, Peru offered Argentina the Chilean territories from 24° to 27° if Argentina adhered to the pact and fought the war. Historians including G. Bulnes, Basadre, and Yrigoyen agree that the real intention of the treaty was to compel Chile to modify its borders according to the geopolitical interests of Argentina, Peru and Bolivia, as Chile was militarily weak, that is, before the arrival of the Chilean ironclads Cochrane and Blanco Encalada. Chile was not informed about the pact, but learned of it first cursorily through a leak in the Argentine Congress in September 1873, when Argentina's senate discussed the invitation to join the Peru-Bolivia alliance. Peruvian mediator Antonio de Lavalle stated in his memoirs that he did not learn of it until March 1879 and Hilarion Daza was only informed of the pact in December 1878. Peruvian historian Basadre states that one of Peru's reasons for signing the treaty was to impede a Chile-Bolivia alliance against Peru that would have given to Bolivia the region of Arica (the vast majority of Bolivian commerce went through Peruvian ports of Arica before the war) and transferred Antofagasta to Chile. These Chilean offers to Bolivia, to change allegiance, were made several times even during the war and also from the Bolivian side at least six times. On December 26, 1874, the recently built ironclad Cochrane arrived in Valparaíso; it remained in Chile until the completion of the Blanco Encalada. It threw the balance of south Pacific power toward Chile. Historians disagree about how to interpret the treaty. Some Peruvian and Bolivian historians assess it as rightful, defensive, circumstantial, and known by Chile from the very onset. Conversely, some Chileans historians assess the treaty as aggressive against Chile, causative of the war, designed to take control by Peru of the Bolivian salitreras and hidden from Chile. The reasons for its secrecy, its invitation to Argentina to join the pact, and Peru's refusal to remain neutral are still being discussed. In 1874, Chile and Bolivia replaced the 1866 boundary treaty, keeping the boundary at 24th parallel but granting Bolivia the authority to collect all tax revenue between the 23rd and 24th parallels south. As compensation for the relinquishment of its rights, Chile did receive a 25-year guarantee against tax increases on Chilean commercial interests and their exports. The duties of exportation that may be levied on minerals exploited in the zone referred to in the preceding articles shall not exceed those now in force, and Chilean citizens, industry, and capital shall not be subjected to any other contributions what ever except those now existing. The stipulations in this article shall last for twenty-five years. All disputes arising under the treaty would be settled by arbitration. American historian William F. Sater gives several possible and noncontradictory reasons for the beginning of the war. He states that there are domestic, economic, and geopolitical reasons for going to war. Several authors agree with these reasons but others only partially support his arguments. Some historians argue that Chile was devastated by the economic crisis of the 1870s and was looking for a replacement for its silver, copper and wheat exports. It has been argued that the economic situation and the view of new wealth in nitrate was the true reason for the Chilean elite to go to war against Peru and Bolivia. The holder of the Chilean nitrate companies, says Sater, "bulldozed" Chilean president Aníbal Pinto into declaring war in order to protect the owner of the CSFA and later to seize Bolivia's and Peru's salitreras. (Several members of the Chilean government were stock holders of CSFA and it is believed that they hired the services of one of the country's newspapers to push their case). Another US historian, David Healy, refutes this, and Fredrick B. Pike calls this allegation "absurd": The economic development that accompanied and followed the War of the Pacific was so remarkable that Marxist writers feel justified in alleging that Chile's great military adventure was instigated by self-seeking capitalists in order to bring their country out of the business stagnation that had begun in 1878, as the war provided Chile with the economic means for coming of age. Sater states that this interpretation overlooks certain important facts. The Chilean investors in Bolivia feared that Daza, the Bolivian dictator, would use, as he did, the war as an excuse to expropriate his investments. Among them were Melchor de Concha y Toro, the politically powerful president of Chile's Camara de Diputados, Jerónimo Urmeneta,:105 and Lorenzo Claro, a Chilean founder of the Banco de Bolivia and a prominent member of the National Party (Chile, 1857–1933). A Santiago newspaper claimed that Melchor de Concha y Toro offered president Pinto $2,000,000 to end the dispute and return to the 1874 boundary line. "In other words", writes W. Sater, "there were as many powerful interests opposed to helping the Compañía de Salitres as there were those seeking to aid the corporation" Also, B. Farcau objects to the argument: "On the other hand, the sorry state of the Chilean armed forces at the outbreak of the war, as will be discussed in the following chapter, hardly supports a theory of conscious, premeditated aggression". Another reason, states Sater, was Peru's desire to monopolize and appropriate the nitrate works to strengthen its nitrate monopoly; in order to achieve it, the Bolivian and Chilean salitreras had to be controlled by Peru. As unenviable as Chile’s situation was in the 1870s, that of Peru was much worse. The 1870s was for Peru's economy "a decade of crisis and change". Nitrate extraction rose while guano exports, the source of substantial revenue for the Peruvian state, declined from 575,000 tons in 1869 to less than 350,000 tons in 1873, and the Chincha Islands and other guano islands were depleted or nearly so. William Edmundson states in A History of the British Presence in Chile "Peru has its own reasons to enter the dispute. Rory Miller (1993) argues that the depletion of guano resources and poor management of the economy in Peru had provoked a crisis. This has caused Peru to default on its external debt in 1876, ... In that year  the Peruvian government decided to procure a loan of seven millions pounds of which four millions pounds were earmarked to purchase privately owned oficinas [salitreras] ... and Peru defaulted again in 1877". To increase guano revenue, Peru created a monopoly on nitrate commerce in 1875. The aims of the monopoly were to increase prices, curb exports, and to impede competition. But most larger nitrate firms opposed the monopoly on sales of nitrate. When this was unsuccessful, in 1876, Peru began to expropriate nitrate producers, and to buy nitrate concessions such as that of Henry Meiggs in Bolivia ("Toco", south of the Loa River). But the CSFA was too expensive and could not be purchased. As Peruvian historian Alejandro Reyes states, this also needed control over the Bolivian salitreras, and that resulted in the internationalization of the conflict, because they were in the hands of Chilean and British capitalists. Later, as the Chilean company was to be auctioned on 14 February 1879 in Antofagasta, it was considered that the Peruvian consul would be the highest bidder. But some sources, says Sater, see the declarations of war between Chile and Peru as a product of popular domestic forces, that is, the president had to enter into war or to abandon and cede. Sater cites the British minister in Lima, Spencer St. John: "the rival parties may try to make political capital out of jealousy for the national honor, and His Excellency [Peruvian President Prado] may be forced to give way to the popular sentiment." Pinto was under similar pressures. For Bruce Farcau, this seems to be the main cause for the war outbreak, as he states: "The argument that the attitude of the peoples of the region was just ripe for war seems best to fit the bill." Miguel Iglesias, later President of Peru. His son Alejandro was killed during the Battle of Miraflores. Juan José Latorre participated in the shelling of Callao, where his brother, Elías Latorre, defended the forts of the harbor. Since 1866 Chilean entrepreneurs José Santos Ossa and Francisco Puelma exploited deposits of sodium nitrate in Bolivian territories (salitreras "Las Salinas" and "Carmen Alto" 122 kilometres (76 mi) and 128 kilometres (80 mi) from Antofagasta respectively) secured by concessions from the then President of Bolivia Mariano Melgarejo. Later, in 1868, British capital was associated and founded the Compañía Melbourne Clark. The company obtained a license to construct a railroad from Antofagasta to Salinas, and the company was renamed to Compañía de Salitres y Ferrocarril de Antofagasta (CSFA), with a minority of British capital of 34%  from the Antony Gibbs & Sons of London, which were also shareholder of salitreras in Peru. The company was established in Valparaíso, Chile. Its shareholders included a number of leading Chilean politicians. In 1871 a new Bolivian Government invalidated all contracts signed by Melgarejo. But on 22 November 1872 a Bolivian decree allowed the government to renegotiate the contracts, which is what the company and the Bolivian Government did. On 27 November 1873 the CSFA obtained from the Bolivian executive a license to exploit saltpeter duty-free for 15 years, but it was disputed whether the decree needed the authorization of the Bolivian Congress. [Notes 1] Some lawyers placed emphasis on con cargo a dar cuenta a la próxima legislatura (Spanish for: "to be accepted by the parliament"), while others on sólo en los casos de no avenimiento (Spanish for "only in conflict cases"). The Gibbs house made repeated unsuccessful efforts in 1876 and 1877 to persuade Edwards (Chilean majority shareholder) to accept a limit in CFSA's production. The historian Ronald Bruce St. John in Foreign Policy of Peru states that "Although persuasive evidence linking Peru to either the ten-centavo tax or Bolivia's decision to confiscate Chilean holdings in Antofagasta never surfaced, it must be recognized that Peruvian interests had deep-seated economical and political reasons for going to war." In 1875, the city of Antofagasta had attempted to impose a 3 cents tax on the CSFA, but the Bolivian State Council (Consejo de Estado) headed by Serapio Reyes Ortiz, later Foreign Affairs Minister during the crisis, refused the tax, because it violated the license of 1873 and the Boundary Treaty of 1874. On 14 February 1878, the National Congress of Bolivia and a National Constituent Assembly approved the 1873 license under the condition that the company would pay a 10 cents per quintal tax, but the company objected, citing the 1874 treaty, that the increased payments were illegal and demanded an intervention from the Chilean government. The CSFA's directory board perceived the tax as a Peruvian move in order to displace Chileans from the nitrate production as occurred in Tarapacá in 1875 as the Peruvian Government expropriated the salitreras. Having surrendered its claim to the disputed territories in return for a Bolivian promise not to increase tax, Chile responded that the treaty did not allow for such a tax hike. Bolivia suspended the tax in April 1878. In November Chile proposed a mediation and cautioned that Daza's refusal to cancel the tax would force Chile to declare null the 1874 Treaty. In December 1878, Bolivia, counting in its military alliance with Peru, challenged Chile and said the tax was unrelated to the treaty and that the claim of the CSFA should be addressed in Bolivian courts, and revived the tax. When the company refused to pay the tax, Bolivia confiscated its property on 11 February and threatened to sell it on 14 February in order to liquidate the tax's debt. In December 1878, Chile dispatched a warship to the area. On 6 February, the Bolivian government nullified the CSFA's license of exploitation and confiscated the property. This news reached Valparaíso on 11 February and on this account the Chilean government decided on the occupation of the region of Antofagasta south of 23°S. On the day of the planned auction, 200 Chilean soldiers arrived by ship at the port city of Antofagasta, and seized it having received no resistance. The occupying forces received widespread support from the local population, the majority of whom were Chilean. Antofagasta's population was 93–95% Chilean. The Bolivian territory between the 23°S and the Loa River (Peruvian Boundary) remained unoccupied by Chilean forces almost one month after the Bolivian declaration of war. On 21 March, Cobija and successively Calama, Tocopilla and other hamlets were occupied; the Chilean government asked the Bolivian public officers to remain in office which they refused to do. 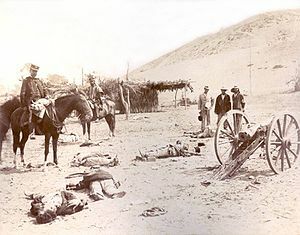 Martiniano Urriola (with kepi), who in 1883 commanded the occupation of Ayacucho, and Marcos Maturana (with poncho), General staff chief of the Expeditionary Army during the Lima Campaign, viewed the dead bodies of a Peruvian gun crew after the Battle of Chorrillos. On 22 February, Peru sent a diplomatic team headed by José Antonio de Lavalle to Santiago, to act as mediator between the Chilean and Bolivian governments; meanwhile, Peru ordered its fleet and army to prepare for war. De Lavalle arrived in Valparaíso on 4 March. On February 27, Daza had made a public manifesto informing Bolivians about the occupation of Antofagasta and calling for patriotic support. The same day, the Bolivian legislature authorized a formal declaration of war upon Chile, although it was not immediately announced. On March 1, Daza issued instead a decree which prohibited all commerce and communications with Chile "while the state-of-war provoked upon Bolivia lasts," provided Chileans ten days to leave Bolivian territory unless gravely ill or handicapped, embargoed Chilean furniture, property, and mining produce, allowed Chilean mining companies to continue operating under a government-appointed administrator and provided all embargoes as temporary "unless the hostilities exercised by Chilean forces requires an energetic retaliation from Bolivia." In Santiago, Lavalle asked for Chile's withdrawal from Antofagasta in order to transfer the province to a tripartite administration (Bolivia, Chile and Peru) without a Bolivian warranty to end the embargo nor of canceling the new tax. Then, on March 14, in a meeting with foreign powers in Lima, Bolivia announced that a state of war existed with Chile. This declaration was aimed to impede further Chilean arms purchase in Europe and to scuttle the Peruvian mediation in Chile. Bolivia called on Peru to activate the alliance treaty, arguing that Chile's invasion constituted a casus foederis. On March 23, while on their way to occupy Calama, 554 Chilean troops and cavalry defeated 135 Bolivian soldiers and civilians dug in at two destroyed bridges next to the Topáter ford. This Battle of Topáter was the first combat of the war. When the Chilean government asked Lavalle directly and officially whether a defensive alliance existed that committed Peru to assist Bolivia in case of a war with Chile and whether Lima planned to honor this agreement, Lavalle could prevaricate no longer: he answered yes to both. Chilean president Pinto sought and received legislative approval to declare war, which he did on 5. April 1879. Peru responded on April 6, when President Prado declared the casus foederis. A metallic brass cartridge for a Fusil Gras mle 1874 and a paper cartridge for a Chassepot rifle. The brass cartridge avoided smoke and ashes of the self consuming paper cartridge. ^ Machuca, Francisco. Las cuatro campañas de la Guerra del Pacífico. p. 341. Historians agree that the belligerents were not prepared for the war, neither financially nor militarily. None of the three nations had a General Staff, medical corps, or military logistics and their warships were in a deplorable state. In Chile, for example, the military contingent had been reduced continuously from 3,776 (by 1867) to 2,400 (by 1879) men:140 and no military unit was deployed north of Valparaiso, 1700 km south of Iquique. :143 By the end of the war, 53% of chief engineers serving in Chilean warships were foreigners. The government of Peru was again in default of payment and in Bolivia, famine spread over the country. According to William Sater, Chile and Peru enlisted temporarily 2% of the male population, Bolivia only 1%. After the Battle of Tacna, both allied armies were disbanded and had to be formed again. The allied forces had at first glance some advantages over the Chilean forces. Their population and armies doubled the Chileans in numbers and the Peruvian port of Callao, with its powerful artillery, was both impregnable for the Chilean navy as well as a secure haven for the Peruvian navy. In Callao, an English company offered the service of a floating dock for ships up to 3000 t, and the Peruvian government used it to repair their ships at the outset of the war. :119 These reasons, among others, led the international press to expect a Chilean defeat as the war started. Moreover, the ambivalent Argentine position and the never ending Mapuche conflict overshadowed the Chilean perspective. :109 J. Basadre says about the public opinion in Peru and Bolivia: "They ignored the real power of Chile and the horrors of war, and simple minded people believed that the allied would win the war because they together were bigger than Chile". But other observers made a more in-depth analysis that showed Chilean political and military advantages. Chile had had a stable political system since 1833 and had developed and strengthened its institutions. 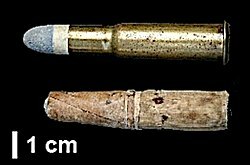 Among them, the army and the navy had educated officers, and soldiers with professional experience in the Mapuche conflict:43 and uniformly modern arms: almost all Chilean fusils were Comblain and Gras of 11 mm caliber for metallic brass cartridge. The Chilean navy also possessed two new ironclads, which were invincible against the older Peruvian warships. Although there were interferences between military and government regarding the right policy of war, the primacy of the government was never discussed. And the Chilean supply line from Europe through the Magellan Strait was only once threatened, in vain, by the Peruvian navy. The allied armies, heavily involved in domestic politics, neglected their military duties and through poor planning and administration bought different rifles with different calibers. This hampered the instruction of conscripts, arms maintenance, and the supply of ammunition. The Peruvian navy warships were, before the war, manned by Chilean sailors who, as the war began, had to be replaced by foreign crews. Bolivia had no navy. The allied armies had nothing comparable to the Chilean cavalry and artillery. Almost all Chilean military operations began with a landing. The exceptions were the operations in the Sierra. Given the few roads and railroad lines, the nearly waterless and largely unpopulated Atacama Desert was difficult to occupy. From the beginning naval superiority was critical. Bolivia had no navy, so on March 26, 1879 Hilarión Daza formally offered letters of marque to any ships willing to fight for Bolivia. The Armada de Chile and Marina de Guerra del Perú fought the naval battles. Early on, Chile blockaded the Peruvian port of Iquique on April 5. In the Battle of Iquique (May 21, 1879), the Peruvian ironclad Huáscar engaged and sank the wooden Esmeralda; Meanwhile, in the Battle of Punta Gruesa, the Peruvian Independencia chased the schooner Covadonga until the heavier Independencia collided with a submerged rock and sank in the shallow waters near Punta Gruesa. In total, Peru stopped the blockade of Iquique, and Chileans lost the old Esmeralda. Nevertheless, the loss of the Independencia cost Peru 40% of its naval offensive power and made a strong impression upon military leaders in Argentina, hence an Argentine intervention in the war became far more remote. The capture of the steamship Rímac on July 23, 1879 while carrying a cavalry regiment (the Carabineros de Yungay) was the Chilean army's largest loss to that point. The loss led Admiral Juan Williams Rebolledo, chief of the Chilean Navy, on 17 August to resign. Commodore Galvarino Riveros Cárdenas replaced Williams, and he devised a plan to catch the Huáscar. Meanwhile, the Peruvian navy had some other actions, particularly in August 1879 during the (unsuccessful) raid of the Union to Punta Arenas, located at the Strait of Magellan in an attempt to capture the British ship Gleneg which transported weapons and supplies for Chile. The Battle of Angamos, on October 8, 1879 proved decisive and Peru was reduced almost exclusively to land forces. In this battle, the Chilean Navy managed to capture the Huáscar after several hours of fierce battle, despite her surviving crew's attempts to scuttle her. From then on the Chilean Navy had to carry troops for the invasion of Peru as well as to provide fire support for amphibious assault and other troops operating within their range. Chilean warships had also to impose a naval blockade of Peruvian ports and to end the smuggling of arms from Panama into Peru via the Pacific Ocean. After Angamos and despite the loss of their two capital ships, Peruvians, with simple and ingenious tricks succeeded in sinking two important Chilean ships, the Loa (July 1880) and the Covadonga (August 1880). But its remaining units were locked in its main port during the long blockade of Callao. On the other hand, the Chilean Navy captured the ship Pilcomayo in November 1879 and the torpedo boat Alay in December 1880. When the Peruvian capital Lima fell after the battles of Chorrillos and Miraflores, the Peruvian naval officers scuttled the entire fleet to prevent its capture by the Chilean forces. The evolution of the land war in the War of the Pacific. After the battle of Angamos and once Chile achieved naval supremacy, the government had to decide where to strike. The options were Tarapacá, Moquegua or directly Lima. Because of the proximity to Chile and the capture of the Peruvian Salitreras, Chile decided to occupy first the Peruvian Province of Tarapacá. Arica and Iquique were isolated and separated by the Atacama Desert, and since the Huáscar's capture in October 1879, neither port had naval protection and couldn't be adequately supplied by sea. Without any communication or withdrawal lines, the area was essentially cut off from the rest of Peru. After the loss of naval capabilities, Peru had the option of withdrawing to central Peru to strengthen its army around Lima until the reestablishment of a naval balance, or building up new alliances as hinted by Chilean historian Wilhelm Ekdahl. But Jorge Basadre assumes that it would have been "striking and humiliating" to abandon Tarapacá, the source of the Peruvian wealth. The land war can be seen as four Chilean military campaigns that successively occupied: Tarapacá, Arica-Tacna, Lima and a last campaign, which disarticulated the Peruvian resistance in the sierra. The occupation of Arequipa and Puno, at the end of the war, saw little military action. Landing and deployment of Chilean and Allied troops during the Campaign of Tarapacá, in November 1879. The Campaign of Tarapacá began on November 2, 1879, when nine steam transporters escorted by half of the Chilean Navy transported ninety-five hundred men plus more than 850 animals to Pisagua, some 500 kilometres (310 mi) north of Antofagasta. After neutralizing the coastal batteries, the Chileans landed and attacked beach defenses in Pisagua. In the event of a Chilean landing, the allied forces planned to counter-attack the Chilean forces in a pincer movement involving advances from the north (Daza's forces coming from Arica) and from the south (Buendia's forces coming from Iquique). 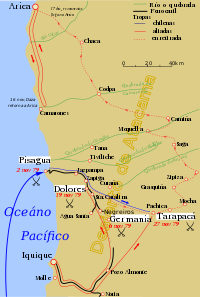 But while Peruvian forces marched northwards as planned after the fall of Pisagua, Daza, coming from Arica, decided in Camarones (44 km from Pisagua) to give up his part of the counter-attack and return to Arica. The Chileans, meanwhile, marched towards Iquique and on November 19, 1879, defeated the allied troops (absent Daza's men) gathered in Agua Santa in the Battle of San Francisco and Dolores. Disbanded Bolivian forces present at the time with the southern force retreated to Oruro, whilst the Peruvians fell back to Tiliviche. 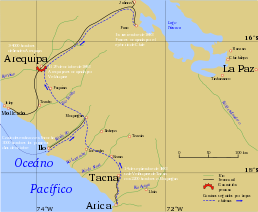 The Chilean army captured Iquique (approximately 80 km/50 mi south of Pisagua) without resistance. Part of the Peruvian force defeated at San Francisco retreated on Tarapacá, a little town with the name of the province, where they combined with Peruvian troops who withdrew to Tarapacá directly from Iquique. A detachment of Chilean soldiers, with cavalry and artillery, was sent to face the Peruvian forces in Tarapacá. The two sides clashed on November 27 in the Battle of Tarapacá, and while the Chilean forces were defeated, the Peruvian forces, without lines of communication with their supply bases in Peru or Bolivia, were unable to maintain their occupation of the territory. Consequently, the Peruvians retreated north through harsh desert terrain to Arica, losing many troops during the withdrawal. Bruce W. Farcau comments that, "The province of Tarapacá was lost along with a population of 200,000, nearly one tenth of the Peruvian total, and an annual gross income of ₤28 million in nitrate production, virtually all of the country's export earnings." The victory afforded Santiago an economic boon and a potential diplomatic asset. The Rimac’s capture, the sinking of the Esmeralda and the passiveness of the Chilean fleet all showed that the command of the navy wasn't prepared for the war, and the army also had trouble with the logistics, medical service and command. Public discontent with the wrong decisions led to riots and the government had to replace the "sclerotics" chief of the navy Juan Williams Rebolledo (by Galvarino Riveros), and the Chief of the army Justo Arteaga (by Erasmo Escala). After Tarapacá, the army was reorganized in divisions. Regarding her foreign policy, Chile tried to separate Bolivia from Peru. Gonzalo Bulnes writes: The target of the "política boliviana" was the same as before, to seize Tacna and Arica for Bolivia and put Bolivia as a Buffer state between Peru and Chile, on the assumption that Peru would accept the Chilean peace conditions. The initiated called such policy "to clear up Bolivia". Moreover, the Chilean government had to find an agreement with Argentina about the border also to avert a war. After the occupation of the salpeter and guano deposits, the Chilean government restituted the "oficinas salitreras", that had been nationalized by Peru, to the owner of the certificate of debt. The alternative of a Chilean State Company of Salpeter was discarded as too onerous for a government waging war, lacking the experienced personnel and the creditors pressing their issue. In 1879 the Chilean state began to exact a tax of 40 cents per "Quintal métrico" (100 kg), increasing to $1.60/qm in 1880. As provided by the secret treaty, the allies agreed in a "Protocol of Subsidies" that Bolivia had to bear the costs of the war. The agreement, which bound the tax income for many years, caused resentments and fears in Bolivia, where the deployment of Bolivian forces to Tacna was seen as a help to Peru and, moreover, when they knew that the Bolivian army wouldn't be sent to free the occupied region of Bolivia but to protect Peru. As Daza and his officers came to Tacna and Arica, they didn't see the expected Peruvian military strength and they understood that their position of power in Bolivia was threatened by a defeat of the allied armies. Bolivian historian Querejazu suggests that Daza used the Chilean offer of Tacna und Arica for Bolivia in order exert pressure on Peru to get a more favorable "Protocolo de Subsidios", which is what he got. Why Daza abandoned the Peruvian forces in Iquique and turned back to Arica just before the Battle of San Francisco is discussed. Some historians say that he wanted to keep the "Regimiento Colorados", the force that secured his political power in Bolivia, untouched. Daza later stated that his officers refused to continue the march through the desert, but his shameful withdrawal accelerated his downfall and he was succeeded by Narciso Campero. In the new government, there was a strong tendency to accept the Chilean offer of Tacna and Arica, but it was eventually refused and Bolivia signed the creation of the United States of Peru and Bolivia, a political fantasy without any practical consequences. Bolivia helped Peru with money and weapons but the Bolivian army never again intervened in the war. In Peru, the political situation was complicated. President Prado had declared war on Chile for deep-seated economical and political reasons but without the funds or international credit to finance the war. He turned over the administration of the state to vice-president Luis La Puerta de Mendoza in order to assume for himself the command of the army. Because of the Chilean blockade, Peru could not export revenue-making goods via its ports. As a consequence, public revenue was cut in half from what had been expected; meanwhile spending was tripled. The Peruvian government in 1879 experienced several political crisis and seven ministers of finance. 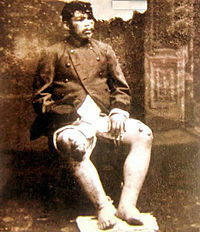 General Buendía, chief of the defeated allied troops in Iquique and More, chief of the sunken warship Independence, were both put on trial but were eventually acquitted. The Peruvian government was confronted with widespread rioting in Lima because of its failures. On December 18, 1879, as the fall of Iquique became known in Peru, president Prado went from Callao to Panama allegedly with the duty to oversee the purchase of new arms and warships for the nation. In a statement for the Peruvian newspaper El Comercio, he turned over the command of the country to vice president Luis La Puerta de Mendoza. History has condemned his departure as a desertion. :27 Nicolás de Piérola overthrew Puerta's government and took power on December 23, 1879. Piérola has been criticised because of his sectarianism, frivolous investment, bombastic decrees, lack of control in budget, but it must be said that he put forth an enormous effort to obtain new funds and to mobilize the country for the war. Basadre considers his work an act of heroism, abnegation in a country invaded, politically divided, militarily battered and economically bloodless. Landing and deployment of Chilean and Allied troops during the Campaign of Tacna and Arica, from January to June 1880. Meanwhile, Chile continued its advances in the Tacna and Arica Campaign. On November 28, ten days after the Battle of San Francisco, Chile declared the formal blockade of Arica. On December 31, a Chilean force of 600 men carried out an amphibious raid at Ilo as a reconnaissance in force, to the north of Tacna, withdrawing the same day. On February 24, 1880, approximately 11,000 men in nineteen ships (protected by Blanco Encalada, Toro, and Magallanes and two torpedo boats) sailed from Pisagua. Two days later, on February 26, the Chileans arrived off Punta Coles, near Pacocha, Ilo. The landing took several days to conclude, but faced no resistance. The Peruvian commander, Lizardo Montero, refused to try to drive the Chileans from the beachhead, as the Chileans had expected. On March 22, 3,642 Chilean troops defeated 1,300 Peruvian troops in the Battle of Los Ángeles, cutting any direct Peruvian supply from Lima to Arica or Tacna (supply was possible only through the long way, via Bolivia). 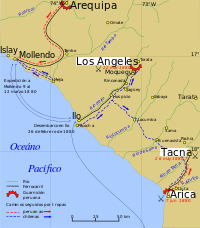 After the Battle of Los Ángeles, only three allied positions remained in southern Peru: General Leyva's 2nd Army at Arequipa (including some survivors from Los Ángeles), Bolognesi's 7th and 8th Divisions at Arica, and at Tacna the 1st Army. These forces were under Campero's direct command. However, the numbers proved meaningless as the Peruvians were unable to concentrate troops or even to move from their garrisons. After crossing 40 miles (64 km) of desert, on May 26 the Chilean army (14,147 men) destroyed the allied army of 5,150 Bolivians and 8,500 Peruvians in the Battle of Tacna. The need for a port near the army to supply and reinforce the troops and evacuate the wounded compelled the Chilean command to concentrate on the remaining Peruvian stronghold of Arica. On June 7, after the Battle of Arica, the last Peruvian bastion in the Tacna Department fell. After the campaign of Tacna and Arica, the Peruvian and Bolivian regular armies largely ceased to exist, and Bolivia effectively left the war. 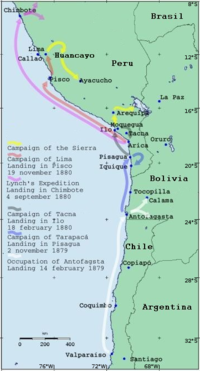 Lynch's Expedition to Chimbote, Supe, Paita, Eten and islas de Lobos, from September to October 1880. To show Peru the futility of further resistance, on September 4, 1880 the Chilean government dispatched an expedition of 2,200 men to northern Peru under the command of Captain Patricio Lynch to collect war taxes from wealthy landowners. 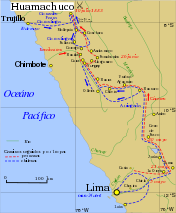 On September 10, Lynch's Expedition reached Chimbote, more than 300 km (186 mi) north of Lima. The expedition levied taxes of $100,000 in Chimbote, $10,000 in Paita, $20,000 in Chiclayo, as well as $4,000 in Lambayeque in local currencies; those who did not comply had their property impounded or destroyed. On September 11, the Peruvian government decreed that payment was an act of treason, but most landowners still paid. Lynch's mission, which infuriated Lima, was allowed by international law at the time. Chilean historian Barros Arana cites article 544 of Johann Caspar Bluntschli's Le droit international codifié, and Villalobos cites Andres Bello's Principios del derecho Internacional. On October 22, 1880, delegates of Peru, Chile and Bolivia held a 5-day conference aboard the USS Lackawanna in Arica, a meeting arranged by the United States Minister Plenipotentiaries in the belligerent countries. The Lackawanna Conference, also called the Arica conference, attempted to develop a peace settlement. Chile demanded the Peruvian Tarapacá province and the Bolivian Atacama, an indemnity of $20,000,000 gold pesos, restoration of property taken from Chilean citizens, the Rimac's return, abrogating the treaty between Peru and Bolivia and Peru's formal commitment not to mount artillery batteries in Arica's harbor. Arica as a settlement was to be limited to commercial use only. Chile planned to retain the territories of Moquegua, Tacna, and Arica until all peace treaty conditions were satisfied. Although willing to accept the negotiated settlement, Peru and Bolivia insisted that Chile withdraw its forces from all occupied lands as a precondition for discussing peace. Having captured this territory at great expense, Chile declined the terms and the negotiations failed. Bruce St. John states in Foreign Policy of Peru (page 116): Peru attended only out of deference to the [USA government] latter, hoping a failure of the talks might lead to more aggressive US involvement. Landing and deployment of Chilean troops during the Campaign of Lima, from November 1880 to January 1881. The long way from Pisco to Chilca was done only by the Lynch brigade. Chorrillos was the preferred seaside resort of Lima's aristocracy before the war, but during the battle of Chorrillos, the Peruvian line of defense run in the middle of the city and it was shelled, set on fire, looted and reduced to rubble during the conflict. At the end of the battle, bitter fighting had raged in every ruin and street. The occupation of the southern departments of Peru (Tacna, Arica and Tarapacá) and the Lynch expedition was proof that the army of Peru no longer possessed the skilled military manpower to defend the country. However, nothing could convince the Peruvian government to sue for peace. The defeated allies not only failed to realize their situation but, despite the empty Bolivian treasury, on June 16, 1880, the Bolivian National Assembly voted to continue the war. On June 11, 1880, a document was signed in Peru declaring the creation of the United States of Peru-Bolivia. 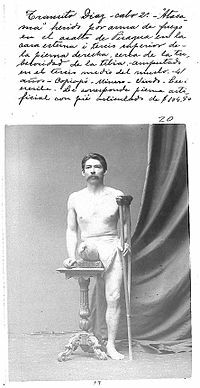 But Piérola continued the struggle. W. Sater states: Had Piérola sued for peace in June 1880, he would have saved countless Peruvian lives and the nation's treasure. The Chilean government struggled to satisfy the public demands to end the war and to secure the peace. This situation forced the Chilean government to plan the occupation of Lima. Once the size of the Chilean army was increased by 20,000 men to reach a strength of 41,000 soldiers, deployed from the forts of the Arauco War to the outskirts of Lima, the Chilean army began the campaign of Lima. Lacking the ships to transport all the troops at once from Arica, the Chileans decided to land first a division and then the rest of the army in stages. Their shortage of shipping also precluded an immediate landing at Lima. Instead, Pisco, approximately 320 kilometres (200 mi) south of Lima, was the first landing point. On 19 November 8,800 men, twenty cannon and their supplies reached Pisco. A party of 400 men was landed near the port and they learned that a 3,000 man Peruvian garrison defended Pisco. To avoid the fight required if a landing was to be made directly into the port, a Chilean vanguard was landed in Paracas, ten miles to the south. This force managed to capture Pisco and on November 20 the rest of the Chilean troops landed, later occupying various other nearby coastal cities, securing for the Chileans de facto control of the Peruvian province of Ica. On 2 December, 3,500 additional men and 416 horses disembarked in Pisco. Some two weeks later, on 15 December, 14,000 Chilean men, 2,400 horses and mules, plus supplies, departed Arica for the north. Baquedano, the Chilean commander, decided that only one brigade in the Pisco region, Lynch's brigade, would march the 55 miles (89 km) north to the coastal town of Chilca, a town only 45 kilometres (28 mi) from Lima. All other Chilean forces would be (re)embarked in Pisco for naval transport to Chilca. The Chilean troops disembarked in Curayaco, slightly north of Chilca, on 22 December 1880. The artillery was later disembarked at Lurín, on the southern outskirts of Lima, as the Chilean army was able to advance quickly after landing. 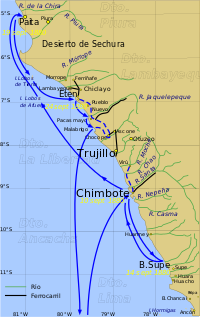 Piérola, who had expected a landing north of Lima, ordered the construction of two parallel lines of Peruvian defences, one at Chorrillos and one at Miraflores. It was hoped the Peruvian professional Army would defeat the Chileans in Chorrillos. If that measure failed, a reserve army, increased with remnants of Chorrillos and the Callao troops, were expected to hold the Chilean advance at Miraflores. The Peruvian forces numbered approximately 25,000 to 32,000 men and were titled the Army of Lima. The main Peruvian defense line ran from the seaside resort of Chorrillos through Morro Solar, Santa Teresa, San Juan, the Pamplona (hills) until Monterrico Chico, a line of defence approximately 15 km long. Gatling guns, artillery, covering forts and trenches located along the top of the steeply natural hills (280 m in Morro Solar, 170 m in Sta. Teresa und San Juan:253) and minefields around the roads to Lima crossing the hamlets of San Juan and Santa Teresa – settlements the Peruvians anticipated would be important targets of the Chilean attack – were all used by the Peruvian military. The second line of defense was less strong, consisting of 7 redoubts (one every 800 meters) for infantry and artillery, that the Peruvians hoped would stop any Chilean offensive. The Chilean General Staff had two alternative plans for their attack. Baquedano, the army chief, advocated a direct and frontal advance through the "Tablada de Lurín", a known area with large areas of relatively plain terrain, against the line of Chorrillos. The advantages of this axis of advance were the shorter distances that had to be covered, a withdrawal line, sea side support from the Chilean navy, water supply (from Lurín), less requirement to train the troops and, as important, less need for complex Chilean discipline to control any advance and subsequent attack. The alternative plan of War Minister José Francisco Vergara laid down a turning movement, bypassing the Peruvian line by attacking from further to the east: through the Lurín valley, moving via Chantay and reaching Lima at Ate. Using this approach meant that Lima could be seized without resistance or both defense lines could be attacked from the rear. Vergara's plan avoided the bloody frontal attack, nullified all defense works, cut any Peruvian withdrawal line to the east into the formidable Andes and would have a demoralizing effect on the Peruvians. However, there were no steady roads for movement of Chilean artillery and baggage, no water, no support from the navy was possible and many bottlenecks – where a small force might stop the whole Chilean army either on the way to Lima, or if it had to withdraw – were a feature of this line of approach. In addition, Vergara's plan required a well trained and disciplined army. Baquedano pushed and eventually succeeded in having his plan adopted. On 12 January 1881 three Chilean formations (referred to as divisions) stepped off from Lurín toward Chorrillos at about 4 p.m., reaching their attack positions at around 3:00 a.m. of the next day. At 5:00 a.m. began the assault on the Peruvian forts: Lynch's division charged Iglesias's positions (Morro Solar to Santa Teresa), Sotomayor's men against Caceres's sector (Santa Teresa to San Juan) and Lagos's division charged Davila's sector (San Juan to Monterrico Chico). Chilean and Peruvian soldiers locked in hand-to-hand combat, attacking one another with rifles, bayonets, rocks and even their bare hands. At the beginning, Sotomayor was unable to deploy in time and Lynch's advance was repulsed. Baquedano was forced to throw in reserve brigades to salvage Lynch's flank. At 8:00am the Peruvian defenders were forced to withdraw from San Juan and Santa Teresa to Morro Solar and Chorrillos (town). At 12:00 midday Morro Solar was captured and the battle continued into Chorrillos, which fell at 14:00 hours (2pm). During the Battle of Chorrillos, the Chileans inflicted a harsh defeat on the regular Peruvian forces, eliminating Lima's first defensive line. Two days later, the second line of defense was also penetrated in the Battle of Miraflores. Piérola's division of forces in two lines has been criticised by Chilean analyst Francisco Machuca. :361 Whether such criticism is justified is debatable. According to Gonzalo Bulnes the battles of Chorrillos and Miraflores have been amongst the biggest in South America regarding the number of combatants, 45,000 in Chorrillos and 25,000 in Miraflores. The estimated death toll was 11,000 to 14,000 personnel, with a further 10,144 injured. On June 15, 1881 Domingo Santa María was elected President of Chile, assuming office on September 18, 1881. A new Congress was elected on schedule in 1882. Argentina had declared itself neutral at the onset of the war, but it allowed the transport of weapons to the allies over Argentine territories, exerted influence on the US and European powers to stop the Chilean advance in the war, pleaded for monetary indemnification instead of cesion of territories to Chile and there was a strong drift in its public opinion in favor of Peru and Bolivia. Moreover, there were Peruvian and Bolivian hopes that Argentina could change its stance and enter in a war against Chile. On 23 July 1881, a few months after the fall of Lima, Chile and Argentina signed the Boundary Treaty that ceded east Patagonia to Argentina and the control over the Strait of Magellan to Chile. Carlos Escudé and Andrés Cisneros state that the treaty was a true victory for Argentina, while Michael Morris considers that "Rearguard Argentine efforts has been made to gain recognition for some kind of shared management regime for the Strait [of Magellan], in order to mitigate what was perceived as the striking diplomatic defeat for Argentina in the 1881 treaty granting Chile control over the strait." After the confrontations in Chorrillos and Miraflores, Peruvian dictator Piérola refused to negotiate with the Chileans and escaped to the central Andes to try governing from the rear, but soon he lost the representation of the Peruvian state. (He left Peru in December 1881). The occupation commanders, first Manuel Baquedano, then Pedro Lagos and at last Patricio Lynch, sited their respective military headquarters in the Government Palace in Lima. The new Chilean administration continued to push for an end to the costly war. But contrary to expectations, neither Lima's capture nor the imposition of heavy taxes led Peru to sue for peace. Conversely, Peruvian caudillos advocated to wage a defensive war of attrition to consume Chile's power so much that they renounced their demand for territory. On 22 February 1881 the pre Piérola Congress (allowed by Chile) reinstated the 1860 Constitution and chose Francisco García Calderón as provisional President but he, assisted by the US Minister in Lima, refused the cession of territories to Chile. He was overthrown by the Chileans in September 1881, but before his relegation to Chile he appointed Lizardo Montero Flores as successor. The Peruvian caudillos organized a resistance which would come to be known as the Campaign of the Breña or Sierra, a widespread, prolonged, brutal and eventually futile guerrilla campaign. They harassed the Chilean troops and their logistics to such a point that Lynch had to send expeditions to the valleys in the Andes. The resistance was organised by Andrés Avelino Cáceres in the regions Cajamarca (north), Arequipa (south) and the Sierra Central (Cerro Pasco to Ayacucho) But the collapse of national order in Peru brought on also domestic chaos and violence, most of it motivated by class or racial divisions. Chinese and black laborers took the opportunity to assault haciendas and the property of the rich in protest of the mistreatment they had suffered in previous years, Lima's masses attacked Chinese grocery stores, and Indian peasants took over highland haciendas. :390- For the occupation forces, the region was an unknown, difficult terrain, force inhibitor, insalubrious (Tunga penetrans, Dysentery), inaccessible, and Chilean military supplies had to be transported from Lima or other points on the coast, or purchased from locals, or confiscated, each option being either very expensive or politically hazardous. An additional problem for the Chileans was information collection in support of their expeditionary force. While Cáceres was informed about the dispositions and moves of his foes, Chileans often didn't know the whereabouts of the guerrillas. In February 1881, Chilean forces under Lt. Col. Ambrosio Letelier started the first Expedition into the Sierra, with 700 men, to defeat the last guerrilla bands from Huánuco (April 30) to Junín. After many losses the expedition achieved very little and returned to Lima in early July, where Letelier and his officers were courts-martialed for diverting money into their own pockets. To annihilate the guerrillas in the Mantaro Valley, in January 1882 Lynch ordered an offensive with 5,000 men under the command of Gana and Del Canto, first towards Tarma and then southeast towards Huancayo, reaching Izcuchaca. Lynch's army suffered enormous hardships including cold temperatures, snow and mountain sickness. On July 9, 1882 they fought the emblematic Battle of La Concepción. The Chileans had to pull back with a loss of 534 soldiers: 154 in combat, 277 of disease and 103 deserters. Because García Calderón refused to relinquish Peruvian control over the Tarapacá Region, he was arrested. Before García Calderón left Peru for Chile, he named Admiral Lizardo Montero as his successor. At the same time President Piérola stepped back and supported Avelino Cáceres for the Presidency. Cáceres refused to serve and supported Lizardo Montero instead. Montero moved to Arequipa and in this way García Calderón's arrest unified the forces of Piérola and Cáceres. Pursuits through Central Peru until Huamachuco. Velasquez march to Arequipa and Puno in October 1883. On April 1, 1882 Miguel Iglesias, Defence Minister under Piérola, became convinced that the war had to be brought to an end or Peru would be completely devastated. He issued a manifesto, es:Grito de Montán calling for peace and in December 1882 convened a convention of representatives of the seven northern departments, where he was elected "Regenerating President" To support Iglesias against Montero, on April 6, 1883, Patricio Lynch started a new offensive to drive the guerrillas from central Peru and destroy Caceres' army. The Chilean troops pursued Caceres northwest through narrow mountain passes until July 10, 1883, winning the definitive Battle of Huamachuco, the final Peruvian defeat. A Chilean soldier with the "Peruvian wart", or Carrion's disease, infected probably in the valleys of the Rimac River during the war in the sierra. Chile and Miguel Iglesias' Government signed the Peace Treaty of Ancón on October 20, 1883, that put an end to the war and ceded Tarapacá to Chile. But the basis of Cáceres' war, the increasingly powerful Indian insurrection against the Chileans, had changed the nature of the war. Indian guerrillas fought "white men from all parties", looted towns and seized land of the white owners. 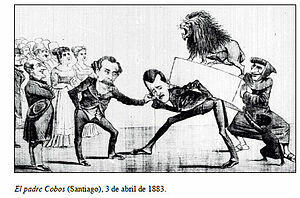 In June 1884, Cáceres accepted Treaty of Ancón, "as an accomplished fact" but he continued to fight Iglesias. Yet long before the civil war was over, it became clear to the hero of la Breña that, in order to build an alliance that would carry him to the presidential palace, he had to mend fences with the "hacendados" as a class, included those who had collaborated with the Chileans. The only way to do so was to give the "hacendados" what they wanted and repress the very guerrillas who had made the Breña campaign possible in the first place. On October 20, 1883 hostilities between Chile and Peru formally came to an end under the Treaty of Ancón. 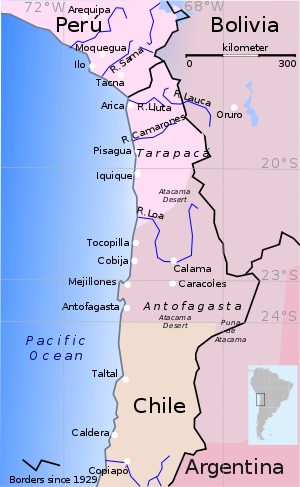 Under the treaty's terms, Peru formally ceded the province of Tarapacá to Chile. Further, the agreement regulated the use of the guano and nitrate resources to repay Peru's debts. Chile was also to occupy the provinces of Tacna and Arica for 10 years, after which a plebiscite was to be held to determine nationality. For decades thereafter, the two countries failed to agree on the terms of the plebiscite. Finally, in 1929, through US mediation, under President Herbert Hoover, the Treaty of Lima was signed by which Chile kept Arica and Peru re-acquired Tacna. In 1884, Bolivia signed a truce, the Treaty of Valparaiso, whereby Bolivia accepted the military occupation of the entire Bolivian coast. The Treaty of Peace and Friendship (1904) ceded the complete region of Antofagasta to Chile. In return, Chile agreed to build the Arica–La Paz railway, a railroad connecting the capital city of La Paz, Bolivia, with the port of Arica, and Chile guaranteed freedom of transit for Bolivian commerce through Chilean ports and territory. As the war began, the Peruvian Army numbered 5,241 men of all ranks, organized in seven infantry battalions, three squadrons of cavalry and two regiments of artillery. The most common rifles in the army were the French Chassepot and the Minié rifles. The artillery, with a total of twenty-eight pieces, was composed mostly of British-made Blakely cannons and counted four machine guns. Much of the artillery dated from 1866, and had been bought for the Chincha Islands War against Spain. The mounts used by the cavalry were small and inferior to the Chileans'. The Bolivian Army numbered no more than 2,175 soldiers, divided into three infantry regiments, two cavalry squadrons, and two sections of artillery. The Colorados Battalion, President Daza's personal guard, was armed with Remington Rolling Block rifles, but the remainder carried odds and ends including flintlock muskets. The artillery had rifled three pounders and four machine guns, while the cavalry rode mules given a shortage of good horses. The regular Chilean Army was well equipped, with 2,694 soldiers. The regular infantry was armed with the modern Belgian Comblain rifle, of which Chile had a stock of some 13,000. Chile also had Gras, Minie, Remington and Beaumont rifles which mostly fired the same caliber cartridge (11 mm). The artillery had seventy-five artillery pieces, most of which were of Krupp and Limache manufacture, and six machine guns. The cavalry used French sabers and Spencer and Winchester carbines. Control of the sea was Chile's key to an inevitably difficult desert war: supply by sea, including water, food, ammunition, horses, fodder and reinforcements, was quicker and easier than marching supplies through the desert or across the Bolivian high plateau. While the Chilean Navy started an economic and military blockade of the Allies' ports, Peru took the initiative and used its smaller navy as a raiding force. The raids delayed the ground invasion for six months, and forced Chile to shift its fleet from blockading to hunting and capturing the Huáscar. After achieving naval supremacy, sea-mobile forces proved to be an advantage for desert warfare on the long coastline. Peruvian and Bolivian defenders found themselves hundreds of kilometers from home while Chilean forces were usually just a few kilometers from the sea. Chileans employed an early form of amphibious warfare, that saw coordination of army, navy and specialized units. The first amphibious assault of this war took place as 2,100 Chilean troops successfully took Pisagua on 2 November 1879. Chilean Navy ships bombarded beach defenses for several hours at dawn, followed by open, oared boats landing Army infantry and sapper units into waist-deep water, under enemy fire. An outnumbered first landing wave fought at the beach; the second and third waves in the following hours were able to overcome resistance and move inland. By the end of the day, an expeditionary army of 10,000 had disembarked at the captured port. In 1881 Chilean ships transported approximately 30,000 men, along with their mounts and equipment, 500 miles (800 km) in order to attack Lima. Chilean commanders were using purpose-built, flat-bottomed landing craft that would deliver troops in shallow water closer to the beach, possibly the first purpose-built amphibious landing craft in history: "These 36 shallow draft, flat-bottomed boats would be able to land three thousand men and twelve guns in a single wave". Chile's military strategy emphasized preemption, offensive action, and combined arms. It was the first to mobilize and deploy its forces, taking the war immediately to Bolivian and Peruvian territories. It adopted combined arms strategy, employing naval and ground forces to rout its allied foes and capture enemy territory. :163 They landed ground forces in enemy territory to raid, landed in strength to split and drive out defenders and then garrisoned the territory as the fighting moved north. Chileans received the support of the Chinese coolies immigrants who had been enslaved by Peruvians, who joined the Chilean Army during the campaign of Lima and in the raids to the north Peruvian cities. Peru and Bolivia fought a defensive war maneuvering through long overland distances and relying where possible on land or coastal fortifications with gun batteries and minefields. Coastal railways reached to central Peru and telegraph lines provided a direct line to the government in Lima. The occupation of Peru between 1881 and 1884 took a different form. The war theater was the Peruvian Sierra, where the remains of the Peruvian Army had easy access to population, resource and supply centers far from the sea; supporting an indefinite war of attrition. The occupying Chilean force was split into small garrisons across the theater and could devote only part of its strength to hunting down dispersed pockets of resistance and the last Peruvian forces in the Sierra. After a costly occupation and prolonged counterinsurgency campaign, Chile sought a diplomatic exit. Rifts within Peruvian society and Peruvian defeat in the Battle of Huamachuco resulted in the peace treaty that ended the occupation. Both sides employed late 19th-century military technology, such as breech-loading rifles and cannons, remote-controlled land mines, armor-piercing shells, naval torpedoes, torpedo boats, and purpose-built landing craft. The second generation of ironclads (i.e. designed after the Battle of Hampton Roads) were employed in battle for the first time. That was significant for a conflict where no major power was involved, and attracted British, French, and U.S. observers. During the war, Peru developed the Toro Submarino ("Submarine Bull"). She never saw action, and was scuttled at the end to prevent her capture. The USS Wachusett (1861) commanded by Alfred Thayer Mahan, was stationed at Callao, Peru, to protect American interests during the war's final stages. Mahan formulated his concept of sea power while reading history in a British gentlemen's club in Lima, Peru. This concept became the foundation for his celebrated The Influence of Sea Power upon History. Flow of news during the War. Distances, in kilometers, are Great-circle distance, for land and sea routes. Since 1876, a submarine cable connected Valparaíso and Lima. :72 Later, at the beginning of the war, Antofagasta and Iquique became connected to the cable. Both navies tried to take control of the cable or severed it according to its military and naval interests. Lima was not connected by cable to Panama, the southernmost post of the North American cable network. Valparaíso had been connected to Buenos Aires by a cable over the Andes since July 26, 1872. Buenos Aires was connected via Uruguay and Brazil, to Portugal, Great Britain and from there to the USA over a submarine cable. It must be emphasized that La Paz, Bolivia's capital city, was not connected by telegraph to the rest of the world. News coming from Tacna, Arica, or Antofagasta to La Paz had to be brought by foot or by horse. The alternative way was from Peruvian port Mollendo (Querejazu: Moliendo) per railroad to Puno then by boat service to Chichilaya, at the Bolivian shore of Lake Titicaca. The last route to La Paz was per horse or foot. The only telegraph in Bolivia was in Tupiza, 606 kilometres (377 mi) south from La Paz, as the crow flies. Tupiza is located at the border to Argentina and was connected to Buenos Aires via telegraph. The traditional transport for long distances were the steamships which connected Valparaíso, Caldera, Antofagasta, Iquique, Arica and Lima to the rest of the world. 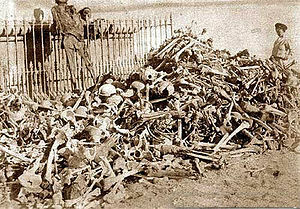 Human remains of Bolivian, Chilean and Peruvian soldiers exhumed from makeshift graves after the Battle of Tacna before their definitive interment in the Mausoleum of the Tacna cemetery in 1910. The three nations claimed to adhere to the Geneva Red Cross Convention to protect the war wounded, prisoners, refugees, civilians, and other non-combatants. At the onset of the war 30,000 Chileans were expelled from Peru (within 8 days) and Bolivia (within 10 days) and their property confiscated; most of them had to shelter in the camps, boats and pontoons of the Peruvian ports until they were transported by ship to Antofagasta. It is calculated that 7,000 of the refugees from Peru enlisted in the Chilean battalions and their resentfulness would later influence the war. Peruvian and Bolivian residents in Chile were not expelled. Beside the Peruvian-Chilean slaughter in the irregular war after the occupation of Lima, an ethnic and social conflict was simmering in Peru between the indigenous peoples and (Chinese) coolies who had been enslaved by Peru's white criollo and mestizo upper class. On 2 July 1884 the guerrillero Tomás Laymes and three of his men were executed in Huancayo by Caceres's forces because of the atrocities and crimes committed by the guerrillas against the Peruvian inhabitants of the cities and hamlets. In Ayacucho, indigenous peoples stood up against "the whites," and in Chincha, the Afro-Peruvians banded together against their owners in the Haciendas of "Larán", "San José" and "Hoja Redonda". Only the Peruvian army could forcibly suppress the revolt. Chinese coolies formed the battalion "Vulcano" within the Chilean Army. There were also inter-ethnic tensions under blacks and coolies. For example, in Cañete, 2000 coolies from the Haciendas "Montalbán" and "Juan de Arona" were massacred by black people. The British historian B. Farcau states: "Contrary to the concept of the 'merchants of death,' the arms manufacturers of Europe and the United States conniving to keep alive the conflict, from which they had earned some welcome sales of their merchandise, the most influential foreign businessmen and their respective consuls and embassadors were the traders in nitrate and the holders of the growing stacks of debts of all the belligerents. They were all aware that the only way they could hope to receive payment on their loans and earn the profits from the nitrate business was to see the war ended and trade resumed on a normal footing without legal disputes over ownership of the resources of the region hanging over their heads." Nonethelesses, belligerents were able to purchase torpedo boats, arms and munitions abroad and to circumvent ambiguous neutrality laws, and firms like Baring Brothers in London were not averse to dealing with both Chile and Peru. :129 Arms were sold freely to whichever side could pay for them (but not British warships). For example, in the 1879–1880 period, Peru acquired weapons from the United States, Europe, Costa Rica, and Panama. Weapons offloaded on the Caribbean coast of Panama were sent overland to the Pacific coast by the isthmus railway. In the Pacific, a number of ships including Talismán, Chalaco, Limeña, Estrella, Enriqueta and Guadiana transported the cargo to Peru. This trade was done with the consent of the president of the Sovereign State of Panamá (then part of Colombia). The Chilean consul in Panama persistently protested against this trade citing a Chile–Colombia agreement of 1844 that prohibited Colombia from providing war supplies to Chile's enemies. In 1881, James Garfield took the oath of office in the US and his anglophobic Secretary of State James G. Blaine was a proponent of an assertive role for the US in the War of the Pacific:43 ostensibly regarding the interests of promoting US ownership of nitrate and guano concesions. :132 Blaine argued that the South American republics "are young sisters of this government" and he would not tolerate European intervention in South America. The groups "Credit Industriel" and "Peruvian Company", representing European and American creditors, had guaranteed to the Peruvian provisional government of García Calderón to pay the Peruvian external debt and the reparations to Chile, but in return the Peruvian government would have to grant mining concessions in Tarapacá to these corporations. With the acquiescence of García Calderon, both companies began to lobby in the United States for the territories to remain under Peruvian sovereignty. For example, the US "Levi P. Morton, Bliss and Company" would get a monopoly on the sales of Peruvian nitrate in the USA. Caricature in the Chilean magazine Padre Cobos. Minister Balmaceda washes his hands of responsibility and ordered Intendent of Santiago Mackenna to get rid of the heavy Peruvian lion. The Santiago elite observes with pleasure the arrival of the statue. "Padre Cobos" and a black child have a nice time playing around. The case of looting and war reparations done by Chilean occupation forces in Peru has caused controversy between historians: being overlooked in Chile and as a source of anti-Chilean sentiment in Peru. The Chilean historian Milton Godoy Orellana distinguishes four events: 1) Looting after the battle of Chorrillos y Miraflores 2) Looting by Peruvians in Lima before the Chilean troops entered the city 3) The Chilean destruction of locomotives, rails, printing machines, weapons, etc. The Chilean government tried to control it through the "Oficina Recaudadora de las Contribuciones de Guerra" whose tasks were: to inventory, to realize the "confiscation", to record and to confirm the transport to Chile, the destination, and the sender. Allegedly, the strategic purposes were to obtain the peace. There is no general list of the looted goods, but many of the shipments were registered in private and official letters, newspaper articles, manifests, etc. 4) The loot of cultural assets of Peru by the Chileans and Peruvians. The development of international law regarding the protection of cultural objects evolved over the 19th and 20th centuries, but the idea of protecting cultural assets first emerged in Europe during the 18th century. The Lieber Code of 1863, while it unconditionally protected works of art during an armed conflict (Art. 35), expressly consented to the use of cultural property as war reparations (Art.36). In fact, Sergio Villalobos states that in 1817 the USA accepted the confiscation of art works but the 1874 Project of an International Declaration concerning the Laws and Customs of War asserted that the cultural assets were to be considered as protected. In March 1881, the Chilean Government of Lima began to seize the Biblioteca Nacional del Perú, 45,000 books were seized, but it is a fact that some of the books were sold in Lima by Peruvians, hence it is contested how much of the booty was taken by the Chilean forces. In any case, in late March 1881, the part of the books arrived to Chile and the press began to inform and discuss about the legitimacy of looting oil paintings, books, statues, etc., or "international robbery" as a journalist of "La Epoca" described it. On 4 January 1883, in a session of the Chilean Congress, the deputy Augusto Matte Pérez questioned Minister of the Interior José Manuel Balmaceda about the "opprobrious and humiliating" shipments of Peruvian cultural assets. Deputy Montt asked the devolution of the assets and was supported by deputies McClure and Puelma. The minister vowed to impede further exactions and to repatriate the objects mentioned in the discussion. Apparently he did it, because the shipments stopped and the mentioned statues are not any more in that place. But not until November 2007 did Chile return 3,778 stolen books to the Biblioteca Nacional del Perú. S. Villalobos asserts that "There was no justification for the theft". Another issue was the damage due to acts of war on properties owned by citizens of neutral countries. In 1884, the Tribunales Arbitrales were constituted with a Chilean judge, a judge named by the country of the claimant, and a Brazilian judge, to deal with the claims of citizens from Great Britain (118 claims), Italy (440 claims) and France (89 claims). A tribunal was established in 1886 for German citizens. The "Italian" tribunal also dealt with Belgian citizens and the "German" tribunal acted for Austrian and Swiss citizens. Spaniards accepted the decision of the Chilean state without tribunal assistance and the USA did not agree at that time. According to international law, animus manendi claims by foreign citizens could only be made if the damaged property had been in an actual battleground (among others: Arica, Chorrillos and Miraflores; Pisagua and Tacna were in a similar situation), while damages caused by individual or scattered soldiers were dismissed. Only 3.6% (CLP 1,080,562) of the demanded value was recognized by the tribunals. According to Villalobos, the verdicts prove that the accusations against the Chilean forces were exaggerated by Peruvians because of wounded pride and by foreign citizens because of monetary interests. The war had a profound and long lasting effect on the societies of the involved countries. The peace negotiations continued until 1929, but the war was over in 1884 for all practical purposes. Día del Mar is celebrated in Bolivia on the 23 of March, at the conclusion of the weeklong Semana del Mar with a ceremony at La Paz's Plaza Abaroa, in homage to war hero Eduardo Abaroa, and in parallel ceremonies nationwide. ^ The Bolivian law of 22 November said (Querejazu 1979, pp. 181–182): Se autoriza al Ejecutivo para transar sobre indemnización y otros reclamos pendientes en la actualidad, y para acordar con las partes interesadas la forma más conveniente en que habrán de llenarse sus obligaciones respectivas; defiriéndose estos asuntos, sólo en los casos de no avenimiento, a la decisión de la Corte Suprema, con cargo a dar cuenta a la próxima legislatura. ^ The Bolivian 5th Division started on 11 October 1879 from Cotagaita bound for Antofagasta, then it was reordered to Iquique, then to Tacna, then to repress any rebellion against Daza in South Bolivia and finally arrived to Oruro 19 Januar 1880. It never entered the Bolivian Litoral but later fought in the Battle of Tacna. Querejazu states that its wandering in Potosi and Oruro was a prove that Daza had been bribed by Chile. See also commons:File:Ruta 5. division de Camacho, en 1879-80.svg. ^ The cruisers Arturo Prat y Esmeralda built in England for Chile and the es:BAP Lima (Sócrates) and the USS Topeka (PG-35) (Diógenes) built in Germany but armed in Britain for Perú. The greek names were a legend to conceal their real destination. ^ a b Sater 2007, p. 349 Table 23. ^ a b Sater 2007, p. 348 Table 22. The statistics on battlefield deaths are inaccurate because they do not provide follow up information on those who subsequently died of their wounds. ^ William F. Sater, “War of the Pacific” in Encyclopedia of Latin American History and Culture, vol. 5, pp. 438-441. New York: Charles Scribner’s Sons 1996. 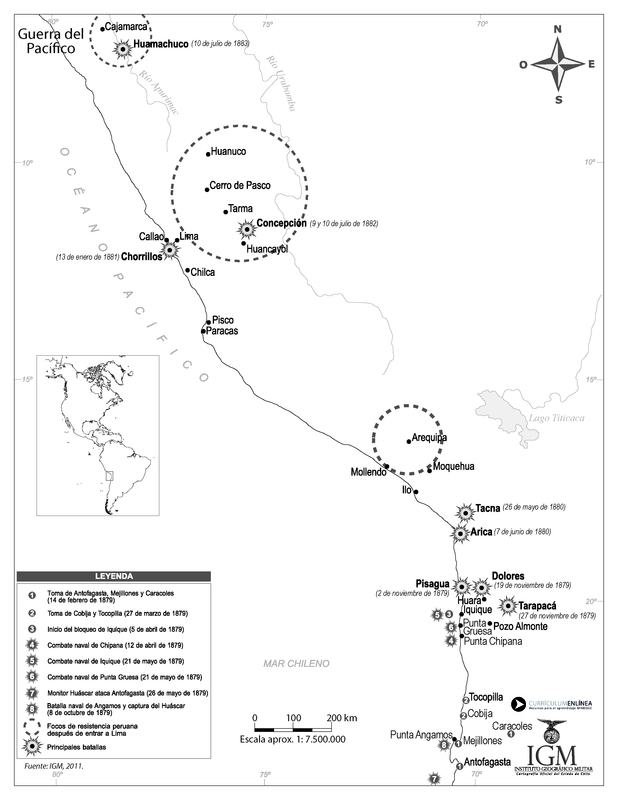 ^ Vincent Peloso, “History of Peru” in Encyclopedia of Latin American History and Culture, vol. 4, p.367. New York: Charles Scribner’s Sons 1996. ^ St. John, Ronald Bruce; Schofield, Clive (1994). The Bolivia–Chile–Peru Dispute in the Atacama Desert. University of Durham, International Boundaries Research Unit. pp. 12–13. ISBN 1897643144. ^ a b Joao Resende-Santos (July 23, 2007). Neorealism, States, and the Modern Mass Army. Cambridge University Press. ISBN 978-1-139-46633-2. ^ Arie Marcelo Kacowicz (1998). Zones of Peace in the Third World: South America and West Africa in Comparative Perspective. SUNY Press. pp. 105–. ISBN 978-0-7914-3957-9. ^ Bethell, Leslie. 1993. Chile Since Independence. Cambridge University Press. pp. 13–14. ^ Vergara, Jorge Iván; Gundermann, Hans (2012). "Constitution and internal dynamics of the regional identitary in Tarapacá and Los Lagos, Chile". Chungara (in Spanish). University of Tarapacá. 44 (1): 121. doi:10.4067/s0717-73562012000100009. ^ a b Carlos Escudé y Andrés Cisneros, Historia de las Relaciones Exteriores Argentinas, Sarmiento y Tejedor proponen al Congreso la adhesión al tratado secreto peruano-boliviano del 6 de febrero de 1873, retrieved on 13 November 2013, archiveurl="https://web.archive.org/web/20131113210142/http://www.argentina-rree.com/6/6-066.htm"
^ Emilio Ruiz-Tagle Orrego (1992). Bolivia y Chile: el conflicto del Pacífico. Andres Bello. pp. 149–. ISBN 978-956-13-0954-8. ^ a b Basadre, 1964 & Chapter 1, "Significado del tratado de la alianza"
^ Basadre 1964, p. 2282 "The beginning of the Peruvian naval inferiority and lack of initiative for preventive war"
^ Nicolás Cruz; Ascanio Cavallo (1981). Las guerras de la guerra: Perú, Bolivia y Chile frente al conflicto de 1879. Instituto Chileno de Estudios Humanísticos. ^ Historia contemporánea de Chile III. La economía: mercados empresarios y trabajadores. 2002. Gabriel Salazar and Julio Pinto. p. 25-29. ^ a b Salazar & Pinto 2002, pp. 25–29. ^ David Healy (January 1, 2001). James G. Blaine and Latin America. University of Missouri Press. ISBN 978-0-8262-6329-2. ^ a b c d Fredrick B. Pike (January 1, 1977). The United States and the Andean Republics: Peru, Bolivia, and Ecuador. Harvard University Press. ISBN 978-0-674-92300-3. ^ a b c d Greenhill, Robert and Miller, Rory. (1973). The Peruvian Government and the Nitrate Trade, 1873–1879. Journal of Latin American Studies 5: pp 107–131. ^ Merlet Sanhueza, Enrique (1997). Juan José Latorre: héroe de Angamos. Editorial Andrés Bello. p. 31. Retrieved June 23, 2015. ^ a b Collier, Simon (1996). A History of Chile, 1808–1994. Cambridge University Press. ISBN 978-0-521-56827-2. ^ a b St. John, Ronald Bruce (1992). Foreign Policy of Peru. Colorado, USA: Lynne Rienner Publishers, Inc. p. 105. ISBN 1-55587-304-9. ^ Manuel Ravest Mora. La Compañía Salitrera y la Ocupación de Antofagasta 1878–1879. Andres Bello. GGKEY:BNK53LBKGDQ. ^ Edmundson, William (2011). The Nitrate King: A Biography of "Colonel" John Thomas North. Palgrave Macmillan. p. 59. ISBN 978-0230112803. La versión chilena fue que Bolivia quiso impedir que Chile se armara. En realidad, Daza buscó la forma de malograr la misión Lavalle. ^ Mellington, Herbert (1948). American Diplomacy and the War of the Pacific. Colunbia University Press. p. 31. "The press in the United States was also almost unanimous in predicting the sound defeat of Chile"
^ a b c St John, Ronald Bruce (1992). Foreign policy of Peru. Lynne Rienner Publishers. p. 109. ISBN 978-1-55587-304-2. ""... the fact that a Chilean victory at the outset was far from certain. ^ Basadre 1964, p. 39 Cap.I "La actitud de la opinión pública peruana"
^ Basadre 1964, pp. 52–53 Cap.I "El Perú y Chile en su evolución republicana"
"... to anyone willing to sail under Bolivia's colors ..."
^ Robert N. Burr (1967). By Reason Or Force: Chile and the Balancing of Power in South America, 1830–1905. University of California Press. pp. 145–146. ISBN 978-0-520-02629-2. ^ a b c Lawrence A. Clayton (1985). Grace: W.R. Grace & Co., the Formative Years, 1850–1930. Lawrence Clayton. ISBN 978-0-915463-25-1. "There are numerous differences of opinion as to the ships' speed and armament. Some of these differences can be attributed to the fact that the various sources may have been evaluating the ships at different times." ^ a b Basadre, 1964 & Chapter 2, "El combate de Angamos"
^ Basadre, Histroria de la Republica, pág. 2357. J. Basadre cites Benjamín Vicuña Mackenna: "Tarapacá era una tumba. Estratégicamente hablando era aquel un ejército perdido porque no tenía base de operaciones, ni líneas de comunicación, ni línea de retirada". ^ R. Querejazu C., Guano, Salitre y Sangre, page 365, version pdf. ^ John L. Rector (November 29, 2005). The History of Chile. Palgrave Macmillan. p. 102. ISBN 978-1-4039-6257-7. ^ Farcau 2000, p. 120"
^ Basadre 1964 Cap. IV "La crisis hacendaria y política"
^ Basadre 1964, p. 31 Cap.IV "Proclamación de la dictadura"
^ Méndez Notari, Carlos (2009). Héroes del Silencio, Veteranos De La Guerra del Pacífico (1884–1924). Santiago: Centro de Estudios Bicentenario. ISBN 978-956-8147-77-8. "Baquedano could not simply bypass the Peruvian troops, whose presence threatened Moquegua as well as the communications network extending southeast across the Locumba Valley to Tacna and northwest to Arequipa and northeast to Bolivia"
^ Farcau 2000, p. 138 specifies 3,100 men in Arequipa, 2,000 men in Arica and 9,000 men in Tacna, but this figure contradicts the total numbers given (below) by William F. Sater in page 229. "...it became evident that there was a total lack of the necessary transport for even the minimum amount of supplies and water"
"The allied force, he [Campero] concluded lacked sufficient transport to move into the field its artillery as well as its rations and, more significantly, its supplies of water"
"Lynch's force consisted of the 1° Line Regiment and the Regiments "Talca" and "Colchagua", a battery of mountain howitzers, and a small cavalry squadron for a total of twenty-two hundred man"
"[The Chilean government thought that it was possible to demonstrate to the enemy the futility of any defense of Peruvian territory not only against the whole [Chilean] army but also against small [Chilean] divisions. That was the purpose of the expedition, which the claims, insults, and affliction in the official documents of Peru and in the press had made famous"
"Bluntschili (Derecho internacional codificado) dice espresamente lo que sigue: Árt. 544. Cuando el enemigo ha tomado posesión efectiva de una parte del territorio, el gobierno del otro estado deja de ejercer alli el poder. Los habitantes del territorio ocupado están eximidos de todos los deberes i obligaciones respecto del gobierno anterior, i están obligados a obedecer a los jefes del ejército de ocupación." ^ Johann Kaspar Bluntschli (1870). Le droit international codifié. Guillaumin et Cie. pp. 290–. ^ a b Francisco Machuca (1929), "Las Cuatro Campañas de la Guerra del Pacífico:La campaña de Lima"
^ a b Carlos Escudé y Andrés Cisneros, Historia de las Relaciones Exteriores Argentinas, El tratado del 23 de julio de 1881, retrieved on 18 December 2014, archiveurl="https://web.archive.org/web/20131202225428/http://www.argentina-rree.com/6/6-088.htm"
^ Folia Dermatológica Peruana, Vol. 10 • Nº. 1 Marzo de 1999. Foto en Imágenes de la Enfermedad de Carrión por Uriel García Cáceres y Fernando Uriel García V.
^ Florencia E. Mallon (July 14, 2014). The Defense of Community in Peru's Central Highlands: Peasant Struggle and Capitalist Transition, 1860–1940. Princeton University Press. p. 101. ISBN 978-1-4008-5604-6. ^ Barros, Mario (1970). Historia diplomática de Chile, 1541–1938. Andres Bello. GGKEY:7T4TB12B4GQ. ^ Dorothea, Martin. "Chinese Migration into Latin America – Diaspora or Sojourns in Peru?" (pdf). Appalachian State University. p. 10. Retrieved September 25, 2011. ^ Augusto Pinochet Ugarte. La Guerra Del Pacífico. Andres Bello. pp. 20–. GGKEY:TLF0S8WSFAA. ^ Mauricio Pelayo González (January 6, 2015). "Combate Naval de Antofagasta". www.laguerradelpacifico.cl. www.laguerradelpacifico.cl. Archived from the original on April 19, 2015. Retrieved January 6, 2015. ^ R.Querejazu 1995 Cap XXXI Que se rinda su abuela carajo! ^ Pereyra Plasencia, Hugo (2005). Una aproximación política, social y cultural a la figura de Andrés Cáceres entre 1882 y 1883 (PDF) (Thesis). ^ a b Hugo Pereira, Una revisión histográfica de la ejecución del guerrillero Tomás Laymes, in Trabajos sobre la Guerra del Pacífico, Pontificia Universidad Católica del Perú. page 269 and ff. ^ a b c d e Kenneth Duane Lehman (1999). Bolivia and the United States: A Limited Partnership. University of Georgia Press. ISBN 978-0-8203-2116-5. "The anglophobic secretary of state ..."
^ GODOY ORELLANA, Milton. "HA TRAÍDO HASTA NOSOTROS DESDE TERRITORIO ENEMIGO, EL ALUD DE LA GUERRA: CONFISCACIÓN DE MAQUINARIAS Y APROPIACIÓN DE BIENES CULTURALES DURANTE LA OCUPACIÓN DE LIMA, 1881–1883". Historia (Santiago) [online]. 2011, vol.44, n.2 [citado 2014-10-26], pp. 287–327 . Disponible en: <http://www.scielo.cl/scielo.php?script=sci_arttext&pid=S0717-71942011000200002&lng=es&nrm=iso>. ISSN 0717-7194. ^ Cunning, Andrera (2003). "Safeguarding of Cultural Property in Times of War & (and) Peace, The". 11 (1 Article 6). Tulsa Journal of Comparative and International Law: 214. ^ Collyns, Dan (November 7, 2007). "Chile returns looted Peru books". BBC. Retrieved November 10, 2007. Barros Arana, Diego (1881a). Historia de la guerra del Pacífico (1879–1880) (History of the War of the Pacific (1879–1880)) (in Spanish). 1. Santiago, Chile: Librería Central de Servat i Ca. Barros Arana, Diego (1881b). Historia de la guerra del Pacífico (1879–1880) (in Spanish). 2. Santiago, Chile: Librería Central de Servat i Ca. Basadre, Jorge (1964). Historia de la Republica del Peru, La guerra con Chile (in Spanish). Lima, Peru: Peruamerica S.A. Archived from the original on December 11, 2007. Villalobos, Sergio (2004). Chile y Perú, la historia que nos une y nos separa, 1535–1883 (in Spanish) (2nd ed.). Chile: Editorial Universitaria. ISBN 9789561116016. English, Adrian J. (1985). Armed forces of Latin America: their histories, development, present strength, and military potential. Jane's Information Group, Incorporated. ISBN 978-0-7106-0321-0. Farcau, Bruce W. (2000). The Ten Cents War, Chile, Peru and Bolivia in the War of the Pacific, 1879–1884. Westport, Connecticut, London: Praeger Publishers. ISBN 978-0-275-96925-7. Retrieved January 17, 2010. Jefferson Dennis, William (1927). "Documentary history of the Tacna-Arica dispute from University of Iowa studies in the social sciences". 8. Iowa: University Iowa City. Paz Soldan, Mariano Felipe (1884). Narracion Historica de la Guerra de Chile contra Peru y Bolivia (Historical narration of the Chile's War against Peru and Bolivia) (in Spanish). Buenos Aires, Argentina: Imprenta y Libreria de Mayo, calle Peru 115. Sater, William F. (2007). Andean Tragedy: Fighting the War of the Pacific, 1879–1884. Lincoln and London: University of Nebraska Press. ISBN 978-0-8032-4334-7. Sater, William F. (1986). Chile and the War of the Pacific. Lincoln and London: University of Nebraska Press. ISBN 978-0-8032-4155-8. Scheina, Robert L. (2003). Latin America's Wars: The age of the caudillo, 1791–1899. Potomac Books, Inc. ISBN 978-1-57488-450-0. O'Brien, Thomas F. (1980). "The Antofagasta Company: A Case Study of Peripheral Capitalism". Duke University Press: Hispanic American Historical Review. Querejazu Calvo, Roberto (1979). Guano, Salitre y Sangre (in Spanish). La Paz-Cochabamba, Bolivia: Editorial los amigos del Libro. Querejazu Calvo, Roberto (1995). Aclaraciones históricas sobre la Guerra del Pacífico (in Spanish). La Paz, Bolivia: Editorial los amigos del Libro. Kiernan, Victor (1955). "Foreign Interests in the War of the Pacific". XXXV (pages 14–36 ed.). Duke University Press: Hispanic American Historical Review. Yrigoyen, Pedro (1921). "La alianza perú-boliviano-argentina y la declaratoria de guerra de Chile" (in Spanish). Lima: San Marti & Cía. Impresores. Chilean caricatures during the war in Tesis of Patricio Ibarra Cifuentes, Universidad de Chile, 2009. Article Caliche: the conflict mineral that fuelled the first world war in The Guardian by Daniel A. Gross, 2 June 2014.